A credit card is a card which allows people to buy items without cash. When they buy something, a sales clerk uses it to charge the money needed to their account, so the person will pay later. They are buying it on credit, which is the trust that they will pay it back later. When a customer purchases a product via credit card, the credit card's issuing bank pays on behalf of the customer and customer has a certain amount of time to pay the credit card bill. If a person does not pay within the time limit (usually a month) they will have to pay extra money, called interest. Payment using credit card is one of most common modes of electronic payment. 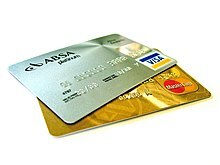 Credit cards are usually small plastic cards with a unique number attached to an account. Most are magnetic stripe cards and many have an EMV chip for use by card readers. This page was last changed on 19 August 2018, at 11:17.